The shut down of two — yes two — segments of I-35E this weekend will likely throw motorists and their GPS systems into a tizzy as they search for alternate routes to send them around the closures and away from prescribed detours that feature constructions zones of their own. Both directions of I-35E between I-94 in downtown St. Paul and Shepard Road will be shut down until 5 a.m. Monday. A few miles up the road, the I-35E will be blocked until 5 a.m. Monday between County Road E in Vadnais Heights and County Road 14 in Hugo. Motorists are directed to use I-35W, which has lane restrictions at County Roads E2 and H due to bridge work. In the west metro, another shut down of northbound Hwy. 100 through Edina, St. Louis Park and Golden Valley is on tap. Leaving town might not provide much relief, either. The Minnesota Department of Transportation is warning about backups and slow traffic on I-35 between Twin Cities and Duluth as thousands head to the Twin Ports for Grandma’s Marathon. Look for single lane traffic in each direction between Hwys. 23 and 48 due to bridge repair. Motorists heading south won’t escape delay either. MnDOT I-35 motorists will encounter lane closures and possibly traffic backups through July 11 between Northfield and Elko while crews complete a bridge painting project. Going northwest? Construction will slow down drivers on I-94 in Rogers and from St. Cloud to Collegeville. Here in town, the North Star Bicycle Festival grand prix races will bring road closures in downtown Stillwater on Sunday. The Twins host the Yankees at Target Field through Sunday. Pop megastar Justin Bieber pays a visit to Target Center Sunday night. And in what might be the biggest congestion generating event of the weekend, thousands will descend on the State Fairgrounds for the annual Minnesota Street Rod Association’s Back to the 50s weekend. 1. I-94 in Rogers: Both directions will be reduced to two lanes from Hwy. 101 to west of Hwy. 241. 2. I-494: Traffic between Fish Lake Road in Maple Grove and Hwy. 55 in Plymouth reduced to two lanes each direction until Nov. 4. 3. Hwy. 100: Northbound lanes between the Crosstown and I-394 will shut down until 5 a.m. Monday. Southbound lanes will remain open, but are reduced to two lanes from W. 36th Street to Crosstown Hwy. 62. 4. 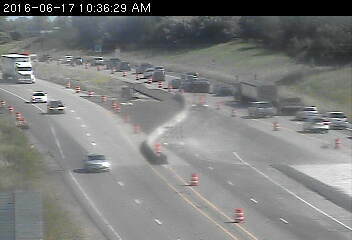 I-35W in Arden Hills: Watch for narrow lanes and lane shifts in both directions at County Roads E2 and H.
5. I-694: Westbound lanes are split with a concrete median between I-35E and Lexington Avenue. 6. I-35E in northeast metro: Both directions closed between County Road 14 and County Road E through 5 a.m. Monday. 7. Hwy. 61: Both directions between the north intersection of Hwy 97/Scandia Trail and 202nd Street are down to a single lane. 8. Hwy. 8: Closed between the south junction of Hwy. 95 in Franconia Township and downtown Taylors Falls. 9. I-35E in St. Paul: Both directions will be closed between I-94 and Shepard Road until 5 a.m. Monday. The St. Clair Ave. bridge is closed through late July. 10. Hwy. 36 and Lexington Avenue: Traffic has been shifted to the new bypass on the south side of Hwy. 36. The ramp from Dale Street to westbound Hwy. 36 is closed as are all ramps at Lexington Avenue under Hwy. 36. 11. Hwy. 280: Closed between Broadway and I-35W and lanes reduced between I-94 and Broadway until mid July. 12. I-35W in Minneapolis: The following bridges over I-35W have lane closures until late June: Eastbound Hennepin Avenue, Westbound Broadway Street and southbound Johnson Street. 13. Hwy. 5: Traffic is sharing the eastbound side of the bridge as crews rebuild the westbound side. It’s single lane traffic between Davern Street and Hwy. 55 through November. Some ramps are closed. 14. I-94 St. Paul to Maplewood: The resurfacing project between E. 7th Street and Century Avenue will last until the end of 2017. The left lane on westbound I-94 from Century Avenue to Mounds Blvd. is closed. Ramp closures include: White Bear Avenue to westbound I-94, McKnight Road to eastbound I-94, Hwy 61 to eastbound I-94 and eastbound I-94 to East 7th St. The connection from northbound Hwy. 61 to westbound I-94 is reduced to a single lane. 15. Randolph Avenue in St. Paul: Closed between Lexington Parkway and I-35E for approximately one month. 16. The Franklin Avenue Bridge over the Mississippi River in Minneapolis is closed until Labor Day weekend. 17. Minnehaha Avenue is closed between 34th and 38th streets in south Minneapolis. In downtown, detours and lane closures are in place along portions of 3rd Avenue S., primarily between 11th Street and Washington Avenue. The intersection of Washington and Marquette avenues will be closed for utility work.